On June 27th, Google combined its DoubleClick and Google Analytics suites under the name Google Marketing Platform. This unified stack gives advertisers a single point of control to plan, buy, measure, and optimize digital media. As a result, marketers can see a unified channel view and measure results across the online customer journey. It’s easy for Google Marketing Platform users to plan ads, place bids, and optimize their customer experiences based on the online results of their campaigns. But what happens when someone engages with your marketing by calling? Are you capturing that interaction in Google Marketing Platform? Not having accurate offline data on calls can be problematic, since mobile ads alone will drive 162 billion calls to US businesses in 2019. The disconnect between the online and offline customer journey makes it difficult to prove the full ROI of your spend and optimize your messaging, targeting, and bidding strategies to drive more customers at a lower cost per lead (CPL). Marketers who pass data on their callers into Google Marketing Platform receive a holistic view of their campaign results, allowing them to make smarter optimizations in an increasingly competitive landscape. 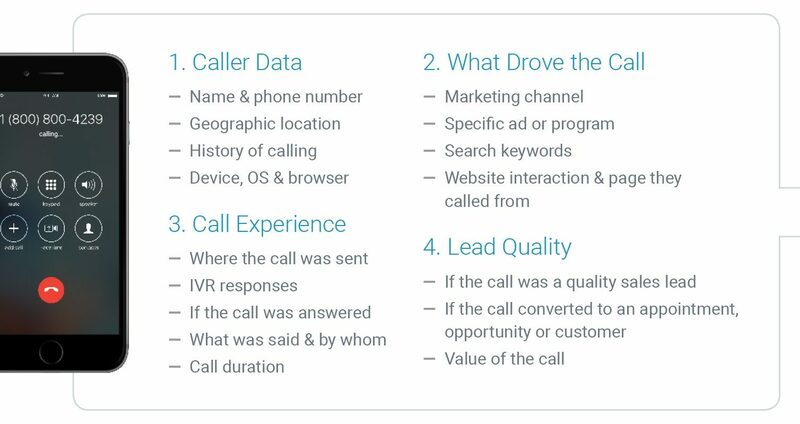 Below, we break down all the advantages of adding call data to Google Marketing Platform — specifically, to its Display and Video 360, Search Ads 360, and Optimize 360 products. What Call Data Is Available to Pass Into Google Marketing Platform? With a call analytics solution like DialogTech that uses AI to analyze conversations, marketers can also select what callers and data they pass into Google Marketing Platform. For instance, if you’re focusing on driving new customers with your campaigns, you can choose to pass only first-time callers into Google Marketing Platform. Or, to remove support and unqualified callers from your metrics, you can just pass quality leads into the platform. As another option, you can pass callers who converted into Google Marketing Platform so you can exclude them from seeing future ads. Why Pass Call Data to Google Display and Video 360? Google Display and Video 360 is a product for planning campaigns, applying audience data, buying inventory, as well as measuring and optimizing results for display and video ad campaigns. It provides marketers with the transparency to see exactly how their budget is being spent and where their display and video ads are running — across all campaigns. For video ads, you can select the percentage of the ad that must be on screen and the amount of time an ad must be visible to register as an impression. Google Display and Video 360 also automates bidding and optimization to help you meet your marketing goals. By adding call attribution data and AI-powered conversation insights to Google Display and Video 360, digital marketers can track how many calls their display and video campaigns are driving, in addition to online conversions. You can collect this call attribution data regardless of whether the caller clicked on — or simply viewed — your ads. In addition to understanding the amount of calls your campaigns are driving, you can also use analytics from conversations — including caller intent, product interest, and call outcome — to determine which campaigns are generating the best calls. As a result, you’ll be able to allocate spend to the campaigns that are truly driving the most revenue. Call data also helps Google Display and Video 360 marketers improve their ad campaign targeting. For instance, if your business fails to convert a caller, you can use the intelligence from that conversation to retarget them with a relevant ad — perhaps offering a discount. If a caller converts to a customer, you can target them with an upsell campaign to entice them to upgrade their product or service. Or, if there’s no opportunity for an upsell, you can exclude the converted caller to avoid wasting spend. Finally, you can put callers who converted into lookalike campaigns so you can find similar audiences to target with display and video ads that are proven to work. Why Pass Call Data to Google Search Ads 360? Search Ads 360 helps agencies and marketers manage search marketing campaigns across multiple engines. Through a combination of powerful reports and automated bidding, Search Ads 360 allows marketers to make smarter campaign optimizations. Call data can assist Search Ads 360 marketers in all the same ways it assists Display and Video 360 marketers — it attributes calls to the marketing source (in this case, down to the specific search keyword), shows you which search campaigns are driving the highest-quality calls, improves ad targeting, and allows you to create lookalike campaigns with proven ads. Sylvan Learning, the leading provider of personal tutoring and enrichment services for students in grades K-12, uses Search Ads 360. To optimize Sylvan’s enrollments and reduce cost per lead (CPL) from search, its agency — DAC Group — needed complete attribution data for every conversion: web forms and phone calls. By collecting call attribution and analytics data using DialogTech and passing those insights into Google Search 360, Sylvan was able to see which paid search ads were driving the most new customer calls to their locations. Using these insights, they made optimizations to reduce their CPL, while increasing search marketing leads by 33%. Why Pass Call Data to Google Optimize 360? Optimize 360 allows marketers to run multivariate website tests to increase engagement, interactions, and ROI. This robust product lets you test up to 36 multivariate combinations and run over 100 simultaneous experiments. In addition, Optimize 360 allows you to seamlessly import your Google Analytics 360 custom audiences, so you can create and test segmented web experiences for different customer groups. Without call data, Optimize 360 isn’t showing your team the full picture. You’re able to test which website layouts and customizations drive the most online conversions — but you’re missing valuable data about call conversions. And for many industries, calls are the most popular and valuable conversion. Site layout B drove 40 online leads worth $70,000 in revenue. With this data, site layout A looks like your best-performing option. Your team would probably elect to use it. Site layout B drove 75 leads (online + calls) worth $150,000 in revenue. If your team failed to pass call data to Optimize 360, you would’ve made the wrong website optimization and selected site layout A — missing out on valuable revenue opportunities in the process.